The last of the big spring consumer electronics trade fairs CeBIT starts tomorrow. Normally we are inundated with press releases and companies trying to book us for briefings, but for some reason this year it is pretty quiet. The main navigation companies: Garmin, Mio, Navteq, Tele Atlas and TomTom are conspicuously absent from the exhibitor list, but hall 7 still has many other companies at the show including NavNGo, and Sygic. This year the theme is "Connected Worlds" focusing on web enabled technologies. Of course there will be broadband and Internet solutions, but of more interest to us will be "Destination ITS". This is a showcase of the wide range of intelligent traffic telematics at the show encompassing Navigation, Information, Traffic Management, Security, Entertainment and Transport. This culminates in the CeBIT in Motion forum. Barcelona 15-18 Feb 2010 sees the MWC 2010 conference take place. I would like to say that I am reporting live from Barcelona, but due to problems with Easyjet yesterday myself and 200+ other people wont be at MWC this year? More of which later. MWC is always an important event but this year we could be on the cusp of the supreme dominance of SmartPhones particularly in the navigation and LBS markets. The battle is on between Android, iPhone, RIM and Windows Mobile. Will this year see the rise of Android and the demise of Windows Mobile? I wish I was there to find out! Thanks Stelios!!! However, unlike Easyjet, we do have contingencies for problems and our roving reporter treading the boulevards will be MaFt, who while I am writing this is flying on his way to Barcelona. Keep a check on the home page for headlines and bookmark this page for more detailed MWC news as it comes in. Christmas and New Year are over so it must be time to pack our bags and head off to Las Vegas for CES. This year it is being held from the 7th to 10th January, but we are heading out early as a lot of the action happens outside the show and before it starts. 2009 was a bad year for most industries, and indeed CES looked a little sparse from the exhibitor point of view, but despite that the innovations continued and the Technology Industry was not affected as badly as others. This is shown by the fact that CES 2010 has a record number of new exhibitors: 330. They will join the 2,500 repeat exhibitors for the show. A number of new features will be showcased this year, including an iLounge for everything iPhone, iPod, and Mac. This despite the fact that Apple themselves will not be in attendance. Whilst on the subject of Apple it will be interesting to see what the main SatNav companies will be showing both from an iPhone and an Android point of view. So far I have not heard of any big announcements from the major SatNav companies, but they always have new developments to show. The most controversial meeting I have set up is with Siano, the company promoting TV on your SatNav. If you are into technology or gadgets then one of the iconic TV shows that you will be watching will be the Gadget Show on Channel 5. This year Suzi, Jason, Jon and Otis will be taking the show live to the public at the NEC in Birmingham from April 17-19 2009. The show which was sold out weeks ago features 3 live presentations each day, plus many how-to and demo theatres. This is all backed by an exhibition with the A-Y (no company Z...) of Gadget Companies will be touting their latest and greatest wares. On the GPS side of things Garmin and TomTom will be there with sales available from The SatNav Warehouse. April 1st - 3rd 2009, Las Vegas will oversee the convergence of more than 1,200 exhibiting companies, dozens of industries, and over 40,000 professionals from 125 countries. The International CTIA Wireless Event 2009 is being feted as the most important global technology event of 2009. PocketGPSWorld.com are proud to have been chosen as Official CTIA Media Partners and we will be in attendance at the show as usual. Check the blog for a series of exhibitor interviews that we'll be publishing to coincide with the show. The first week of March is the time for the biggest European tradefair CeBIT. This year is is being promoted as the German-Californian ICT Summit, and Arnold Schwarzenegger will be joining the German Chancellor Angela Merkel at the opening ceremony tonight. Mobile World Congress is the most important global tradefair for mobile phones and the underlying technologies and infrastructure. MWC attracts both visitors and exhibitors from around the globe, showcasing the latest developments in the marketplace. MWC is quite different from the other trade shows we visit as it is totally targeted towards mobile communications. Despite the global recession there are lots of announcements and excitement buzzing around just in time for the show. Garmin and Asus are collaborating to produce the NuviPhone, CSR have just taken over SiRF. Android seems to be on everyone's lips... Not forgetting the Apple iPhone. Apple will not be there, but there are many other companies with iPhone accessories and applications. We are already hearing rumours of more Navigation applications, but none have reached the AppStore yet. I will be travelling light for this show and will not have my computer with me, but hopefully I will be able to keep you up to date using the on-site press facilities. It is January 1st, and that can only mean two things: I have a hangover from last night and I need to get packing ready for CES in Las Vegas. CES 2009 will be interesting. When the World is in the middle of an economic downturn Consumer Electronics are not the first thing on most people's shopping lists. Coupled with the dive that Sterling has taken just visiting the USA is going to be expensive this year. With this foundation the CES exhibitors need to put on some spectacular presentations to entice the buyers. Already I have heard that a number of Far Eastern companies will not be attending, the economics of exhibiting just don't work for them. On the other hand we will still see a lot of high cost marketing there. Dozens of celebrities from all walks of life have been contracted from Sports Stars to Music greats such as Stevie Wonder and Diana Ross. So it sounds like the party budget is still in place. On a more serious note the major GPS players will be there, including TomTom, Garmin, Mio and Magellan. We are wondering if Magellan will be on the Mio stand like Navman were last year. We are expecting an announcement from Eclipse regarding the latest in-dash version of TomTom (a not too well kept secret). As usual there will be companies from around the globe attempting to secure a slice of the lucrative pie that is the US electronics market. The PocketGPSWorld.com CES 2009 team will include Darren, Lutz, Maft and Mike. Together we will be ferreting out the juicy news and some of the more odd products on show in Sin City. As usual if you have any questions that you would like us to put to the GPS companies please post your queries in the CES forum thread below and we will do our best to ask the right people. IFA 2008 is billed as the "world’s leading trade show for the general public". In March we have the CeBIT Trade Fair in Hannover specifically targeted towards the business community showcasing the latest developments in the company's product lines. In contrast IFA is more of a consumer exhibition with companies demonstrating actual products that are either in the stores or will be in time for the Christmas rush. IFA is also a Trade Fair for businesses to visit and discover the latest in technical goodies that they will be selling in their shops. The IFA show is an all encompassing event covering all aspects of Consumer Electronics from the latest super sized LCD TVs to washing machines. Sandwiched somewhere in that range is the SatNav, GPS and Mobile products... There are over 30 GPS companies exhibiting at the show including some of the main SatNav companies like Garmin, Mio, Navigon and TomTom along with some of our friends from Taiwan such as Holux and GlobalTop. All in All it looks like being a great show. Darren and I will be reporting from Berlin later this week. If you have any questions that you would like us to put to the manufacturers please add it to the comments. This week sees the start of CeBIT 2008, billed as "the world's largest trade fair showcasing digital IT and telecommunications solutions for home and work environments". Last year the show was a little disappointing with the main interest being provided by NavNGo with iGO v8 and a number of low profile stands and an absence of TomTom consumer products. This year is going to be different. We are already aware of some important announcements to be made by Navigon, NavNGo and TomTom. NavNGo had the biggest stand of the SatNav companies last year and told me that this year's would be 3 times the size. Times move on and brands change. What we all know as 3GSM has now become MWC (Mobile World Congress). February is the time of year when anyone who is anyone in the world of mobile communications converges on Barcelona for the Exhibition and Conference. Over the last few years this has become more focused on GPS and Location based services. This year there are conference sessions on GPS and how to improve positional data, and of course the Navteq LBS Challenge European final will be held there. 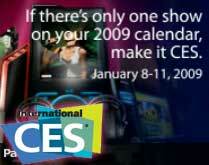 Its New Year 2008 and that means that we are off to Sin City for the annual Trade Fair season opener of CES. Every January everybody in the Technology World descends on the Las Vegas Convention Center and a lot of the surrounding hotels as well to witness one of the largest shows of new consumer electronics in the World. We have been going for the past few years, and have watched the growth of GPS and related products in the US market. This year seems to be bigger than ever again, reflecting the fact that the North American GPS market is booming and is starting to catch up with the Europeans. There seem to be quite a lot of new players entering the market from Goodyear to Harman/Becker, and the range of products is looking promising too. The trend of 2007 with geo-tagging of digital photos seems to be growing with at least 4 new companies entering the market. Of course the SatNav market will be represented by some of the big names including TomTom, Garmin, NavNGo, not forgetting the mapping companies Navteq and Teleatlas. Right now I am starting to pack in anticipation of getting my hands on some neat goodies... The show starts on Monday with a preview Sunday evening, so keep tuned to this page and see what is going on in Las Vegas. Action Medical Research have organised a 300 mile (500 Km) charity bike ride from London to Paris from July 25th to 29th. Look out for us on the route, which hopefully we will be able to post online each morning before we start out. Last year was the first time we ventured into the heart of the technology manufacturing region of the World in Taiwan, when we visited the largest Asian technology expo: Computex 2006. Well it is nearly June again and Computex 2007 is fast approaching. This year both Mike and Darren are taking the opportunity to visit the tradefair and see what new products will be coming out of the far east over the next few months. We were impressed with the HUD bluetooth receiver from GlobalTop that was on display at CeBIT, and are wondering what new and novel GPS products will catch our eye in Taipei. We have already heard some rumours about various Speed Camera detectors. It is also quite interesting to see what is tucked away out of sight at these shows. There is a lot of competition between the GPS (and other) companies in Taiwan and the companies tread a delicate line between attracting the attention of buyers and letting their competitors know what they are about to release. Whilst we are out there we have taken the opportunity to organise a visit to some friends in Hsinchu City, where Holux and Evermore are based. Hopefully we will be able to give you an insight into the development and manufacturing processes for GPS products. 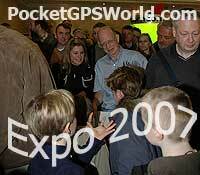 The PocketGPSWorld.com Expo comes to Sandown Park Racecourse on Saturday 21st April from 10am to 4pm. Our Hosting Sponsor will be Navman, Mapping Sponsor Navteq, and Premium Sponsors confirmed so far include TomTom, Garmin, Ordnance Survey, TeleAtlas, CoPilot, Navigon, Via Michelin, Nemesis and iGO. As usual we will be holding a raffle with some fantastic prizes including several donated navigation systems and the proceeds will this year be donated to Great Ormond Street Hospital’s GOSH appeal. Entry is free of charge. There is ample parking available at the racecourse and the site is easily accessed from the A3 and M25. Pre-registration is no longer required, just turn up. NOTE: The PostCode for Sandown Park and the POI on some Satnav's will direct you to the wrong location, close but wrong! Not a great advert for the benefits of satellite navigation. If you are using a navigation device to direct you to the show, the entrance to Sandown Park is on the North side of Portsmouth Road near to the junction with Littleworth Common Road and is well signposted. Please use the forums and not email for questions or comments. To comment on the Sandown Park Expo click here. CTIA has two shows a year, one in the spring, and one in the fall. The spring show focuses on infrastructure, and systems, whilst the fall show features more content and software. Both of the major mapping companies are present at the event with Navteq holding it's American LBS Challenge event at the show. CTIA's spring trade show is the premier venue for all things wireless! This trade show has the distinction of being the largest and most comprehensive in the industry. If it has to do with wireless it can be found here. CTIA's fall trade show is the largest industry event whose sole focus is on the emerging role wireless data plays in the realms of Enterprise and Entertainment. America’s businesses are putting wireless to work, and it’s making them more productive and efficient than ever. Also, the growing world of wireless entertainment, such as music, video, and games, is on center stage at this annual event. CeBIT 2007 is rapidly creeping up on us. It seems like only yesterday we were at CES in Las Vegas, and now we are getting ready, along with thousands of other companies, for CeBIT 2007 in Hannover Germany. CeBIT 2007 runs from the 15th to the 21st of March. Last year TomTom broke with tradition and announced their new products a couple of weeks before the tradefair. This seems to have started a new trend and both Navigon and Garmin have released details of some new products. In light of this we have started our CeBIT 2007 reporting just that little bit early. The PocketGPSWorld.com team will be out in Germany with Darren, Lutz, Maft and myself. We will be having meetings with all the main companies, and a lot of the other manufacturers as well. If you have any questions that you would like us to ask any company a question, post it in this forum you can also use the forum to discuss CeBIT news and events. The 3GSM conference is taking place in Barcelona, Spain from the 12th to the 15th of February. Over the years 3GSM has become more and more of an important event in the PocketGPSWorld.com calendar. With the emergence of connected devices and converging technologies the PDA is slowly dying and being replaced by SmartPhones some of which have 3G, WiFi, and GPS all integrated into a PDA sized device. Nokia have brought navigation to the fore by buying the Berlin based mapping company Gate5, and have recently announced free mapping using the Gate5 Smart2Go navigation application on compatible devices. With the biggest hand held device manufacturer in the world backing GPS SatNav there is only one direction this market is going and that is UP!! Once again I have been invited by Navteq to be one of the Judges in the Navteq LBS awards where a number of finalists present solutions involving mapping, GPS and specific localised knowledge. The Judging takes place over the weekend leaving me free to walk the halls on the opening day, something I was unable to do last year. As usual I do have a slight crisis on my hands: I don't have a hotel room for Monday or Tuesday, and all the rooms in Barcelona are booked... This could leave me either coming home early or finding a kind person to share with for the night... Lets see how things work out! If you would like me to ask any exhibitor a question please post it in this forum or use the forum to discuss items in the blog. Well the tradeshow season is just about to start for 2007. The CES (Consumer Electronics Show) is the largest event held in North America and is often the showcase for many new products, and of course a great meeting place for all those in the technology industry. From the GPS side of things all the major players are going to be there with hints of lots of new and improved products. We already have a number of meetings set up with some of the main SatNav industry companies on the US side of the Atlantic. Monday is the first day of the event, with most of the big hotels in Las Vegas hosting some event or other throughout the week. Click here to discuss or send us a question to ask one of the SatNav companies. As usual with the show there is a wealth of fantastic machinery on display from the humble family car to some of the top of the range supercars like the Mercedes SLR (I only have another £300,000 to save to get one!!!) and just about everything in between. Of course there are many GPS companies there as well. British Heart Foundation Charity Bike Ride. PocketGPSWorld.com like to support worthy charities, and with the up and coming reviews of the Garmin Edge 305, Garmin Forerunner 305 and GlobalSat GH-601 we thought it was appropriate to enter a team into the London to Southend Bike Ride. This is run by the British Heart Foundation charity. Starting in Victoria Park in East London and finishing in Priory Park in Southend the route winds through some of southern Essex's prettiest villages over a distance of nearly 60 miles... If you want to see some of the latest sports and fitness GPS devices then we will have them on our bikes and scattered about our bodies. If you see us on route just give us a shout. With support from Garmin, GlobalSat and Mio the PocketGPSWorld.com team will be giving the GPS systems a thorough workout. Some of the team intend to really go for it and see if they can crack the 3 hour mark, others will take it easy and enjoy the ride. If you want to join in the ride you can either pre-register, or just turn up at Victoria Park, East London on the day. Click here then select bike rides for more details on the British Heart Foundation site. If you would like to support PocketGPSWorld.com and the British Heart Foundation charity you can make a donation via PayPal using the Donate button to the left. 100% of the money donated will be presented to the Charity, PocketGPSWorld.com will also match the sum of the donations. Computex is in it's 26th year. And this year is going to be bigger and better than ever before. For some time now Taiwan has been one of the major centres of technology development in the World a fact that is proven by the sheer number of Taiwanese companies visiting CES and CeBIT. On their home ground in Taipei, Taiwan Computex expects to have over 1,300 exhibitors displaying their products. There will of course be the familiar companies such as GlobalSat, Haicom, Leadtek, Mio, Rikaline and RoyalTek, but there will also be lots of other manufacturers displaying their latest developments. PocketGPSWorld.com are going to be attending the show to report on some of the new products that will be hitting the shops in time for Christmas. Computex runs from the 6th to the 10th of June at the World Trade Centre in Taipei, Taiwan. The team at PocketGPSWorld.com are now in he final stages of preparing for our biggest and best SatNav event. Matt and Mike went to check on the arrangements and exhibition hall on Monday after the Geocaching weekend in the Lake District. Robert arrived yesterday and is pulling the organisation of the event together right now. We are getting excited about this now. After months of planning it is only a few days away. We are still getting donations into the Prize Draw from both exhibitors and those companies unable to attend. These include a number of top of the range SatNav systems. The current list of prizes may be viewed here. All proceeds from the draw will go to The Edinburgh Royal Hospital for Sick Children, which I think we all agree is a very worthy cause. Whilst we were up in Edinburgh we scouted out a location for our Geocaching competition sponsored by Globalsat. This is a simple competition that anyone can enter, and you don't even need a GPS to enter. Click here for more details. There's gold in dem dere hills!!! In steps our very own mysk... Little does he realise that lie-ins over the weekend have been cancelled. He is going to be our novice GPSer for the weekend. Starting Friday with a drive up to Burrowdale in the PocketGPSWorld.com car, followed by some cycling, walking, running (not me of course), and not to mention theory and practical sessions he will be tired out by Monday morning in time for work. CeBIT is over and the team has crawled home. It was an eventful week, with lots of good discussions, and even some new products. The blog will soon be closed. Before we do that each team member will write up what their take-back was from CeBIT - overall impression. biggest GPS related item, biggest non-GPS related item. Well March is here again. That means two things: Firstly it is spring time we have seen the worst of the winter and can now look forward to a warm summer. Secondly it is the time of year when anyone who is involved in technology heads to Hannover, Germany for CeBIT. This year looks like it is going to be slightly different. TomTom have already announced the new GO range of hardware. Navigon have already announced one of the least kept secrets Navigon 6. There are lots of other rumors flying around, we will see which of them are true in the next few days. As usual PocketGPSWorld.com will be fielding a team for the duration of the Expo. This year we are proud to be exhibiting at the show promoting UK excellence on one of the UK Foreign Office stands. This year, the world's premier mobile event is making 3GSM World Congress history with record breaking pre-registrations. 962 companies have signed up as exhibitors, showcasing their latest mobile products, services and solutions - a massive 40% increase from last year! 50,000 visitors are also expected in Barcelona. And, of course, PocketGPSWorld.com will be there to report on the new innovations and products being announced at the exhibition. Not only will we be reporting from the show, but we have been invited by Navteq to judge the Navteq LBS Competition. PocketGPSWorld.com are among the few privileged guests to be invited to the official product launch of the Garmin Topo Great Britain for the range of Garmin compatible GPS devices. Robert and Mike were given a demonstration of the latest and greatest Garmin hardware and mapping. Garmin have had Street Mapping Data and Marine charts available in the UK for some time now in the form of MapSource. Topographical mapping has been available in the US now it will shortly be available in the UK.